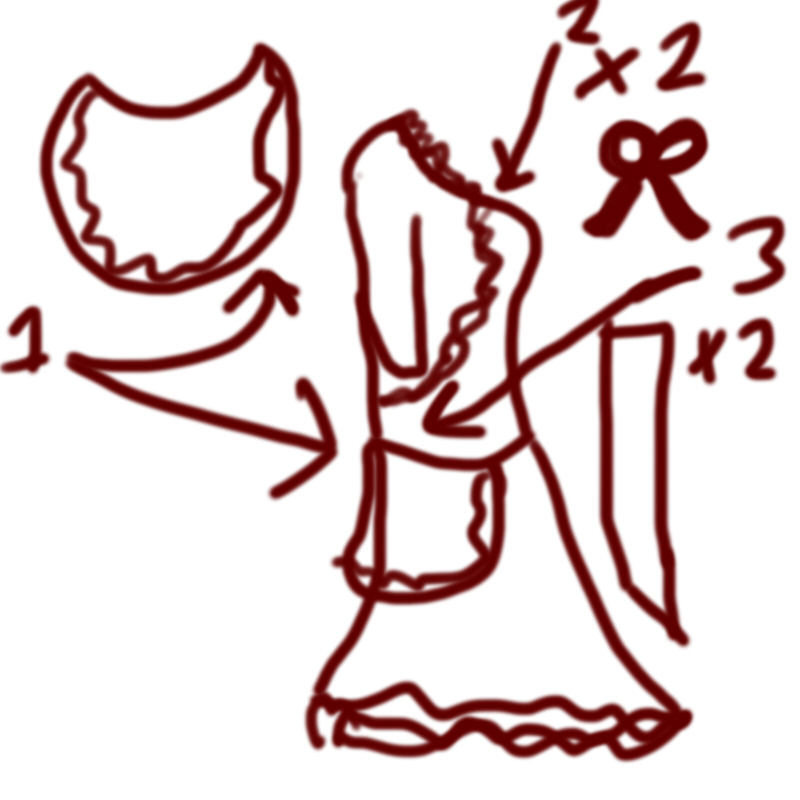 I decided to make a tutorial for the dress, but since I didn’t actually take any process photos, I threw together (emphasis on the thrown together) some diagrams and I’ll try to explain how this dress went down and how to re-create it if you are so inclined. Here’s the full photo shoot of the dress if you missed it! Click below if you want to see the full tutorial! I wasn’t really planning on writing a tutorial for this dress, otherwise I would’ve taken pictures of the process! But alas, I did not think that far ahead (honestly I wasn’t sure if this dress was even going to work in the first place since this was my first time making up a pattern in my head). I drew out some diagrams showing a rough process of what I did, if I’ve left anything out or something makes no sense, shoot me a comment! I made a test run of dress bodice out of some god awful ugly fabric that would’ve been thrown out otherwise, waste not want not right? It fit and actually looked like a top, so I ventured onward! I ended up using one grey flat twin size sheet (five bucks each), two creme flat twins, an invisible zipper (two bucks), and a set of buttons (and a dollar). I was very surprised at how cheap it was to round up the materials for this, eighteen bucks is pretty thrifty! Here are what my pattern pieces ended up looking like; to help give you an idea of what to shoot for. 1. This is for your shoulder strap, measure from where you want the strap to hit by the side of your neck, to where the shoulder seam will be. (I just wore a well fitted t-shirt and went off it’s shoulder seam.) Draw a line using that measurement, and make sure to slope it down towards your shoulder, you don’t want a straight line because shoulders are curvy! 2. Measure from where you want the neckline to hit, to a bit above your natural waist. This is a pretty high waisted dress, so you can tweak this measurement to make a longer bodice. 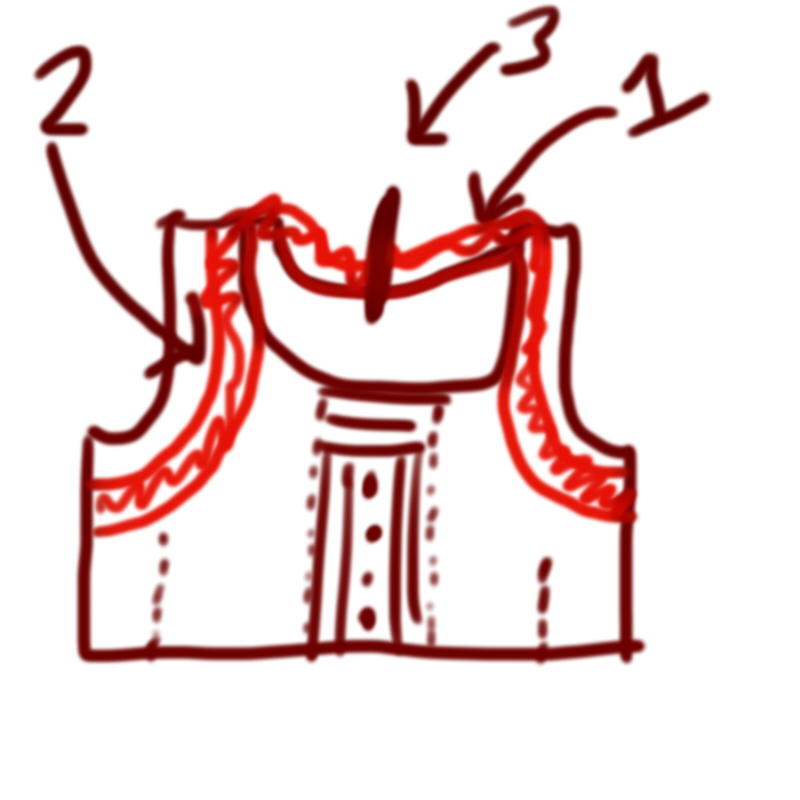 I wanted a square neck so I made sure that the end of the neckline was completely horizontal, if it has any curve at all, when you sew the other half of the bodice it’ll look funky and not square. 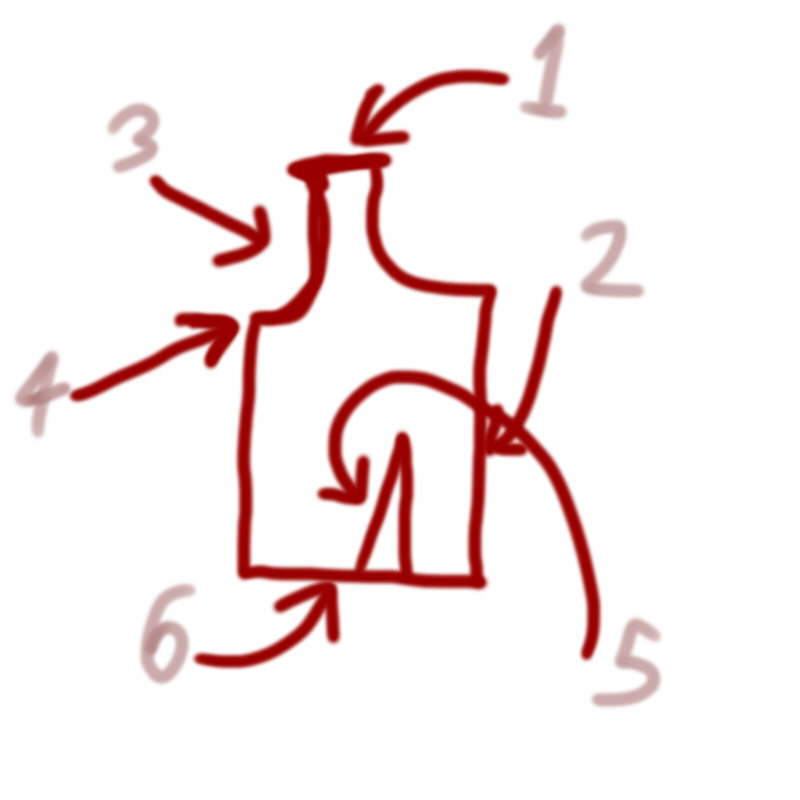 Figure out your chest measurement, and halve it, this is how wide you want the top of the bodice pattern to be. 3. Measure around your arm just a bit down from the shoulder, and halve that measurement. This is only half the top, so make sure that you remember to halve all measurements like that. I used a bendy measuring tape, curved it, and layed it on the paper to draw out the armhole, make it way more scooped out than you think it needs to be, or you won’t be able to swing your arms much when you sew the sleeves on. 4. Draw a line that very slightly curves inward to the bottom of the pattern piece, the curve will give the top a bit more shaping. 5. This part is a bit tricky. Measure your natural waist, and halve that measurement. It’s probably going to be a bit smaller than your chest measurement, and we want to keep the waist from looking baggy. Subtract your waist measurement from your chest measurement, this will tell you how big you need to make your darts. The darts will help make the waist fit snugger. Take the number you got, and divide it by four (there are going to be darts in the back too, we’ll worry about that later). That will be how wide you want your darts to be. Draw the base of the dart with that measurement, and then just turn it into a long skinny triangle. When you cut out your pattern pieces, make sure to cut that dart out too. If you want the top to be looser, or more fitted, you can cut out smaller or bigger darts. 6. 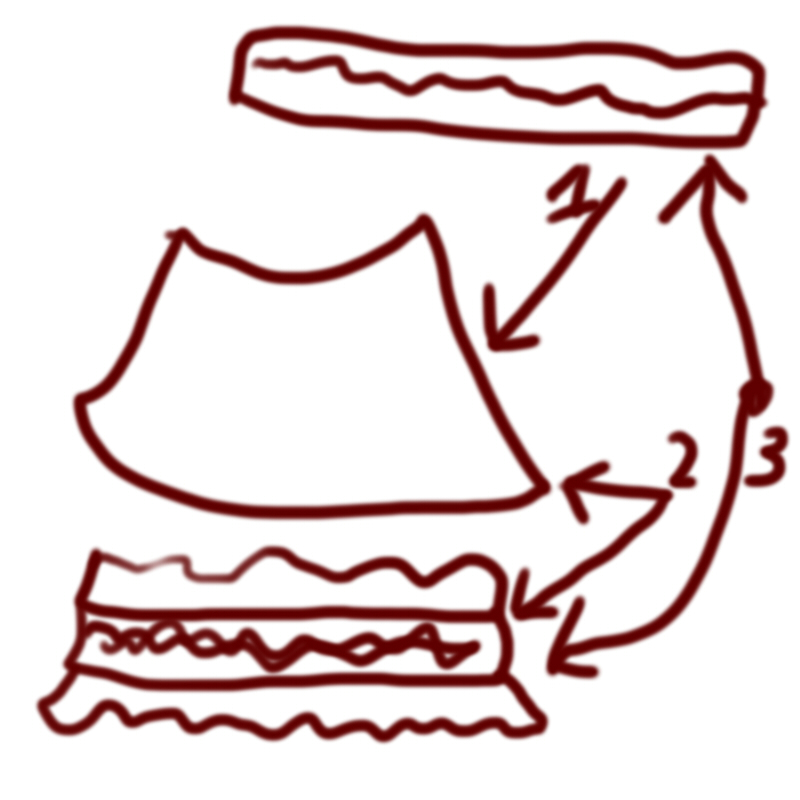 Draw a straight line connecting the middle seam, and the side seam. 1. Now we’ll create the back of the top! Trace the front piece exactly the same, but skip the deep neckline, and draw a very slightly scooped out neck that flattens out at the end. Cut your back pattern out before starting the next step. 2. I didn’t want to fuss with the pintucking on the main bodice piece, so I just cut a chunk of the bodice pattern off, and let it hang out there. You’ll sew the piece back on later, this will just make the pintucking way easier to do. 3. The darts of the back piece will be in the exact same place as the front, so just trace those out. 4. I used this awesome tutorial to draft the sleeve pieces, since I didn’t trust myself to totally wing sleeves. Measure from the top of your shoulder to your elbow, this is how long you want the main sleeve piece to be. Part three! 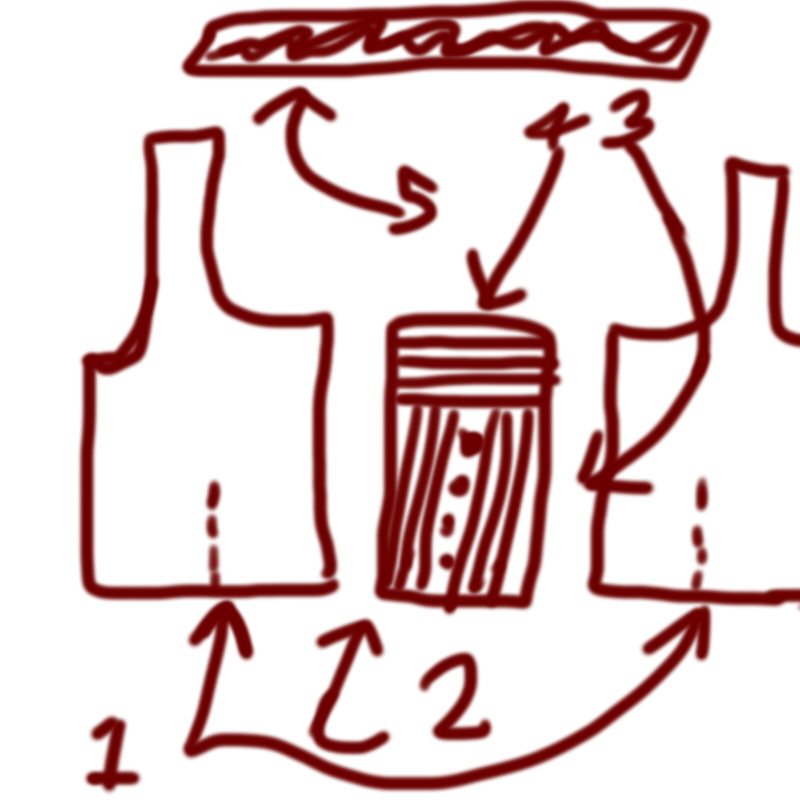 You should have all your pattern pieces drawn out now, cut out two front bodices, one of that little middle piece, two backs, and two sleeves. Make sure to cut a 1/4 inch around all the pattern pieces to account for seam allowances. 1. The bell sleeves are basically just mini circle skirts if you think about it, so I used this circle skirt calculator, and just put the width around just above my elbow instead of my waist measurement. They were a little too gathered with a 360″ circle, so I cut a chunk out. 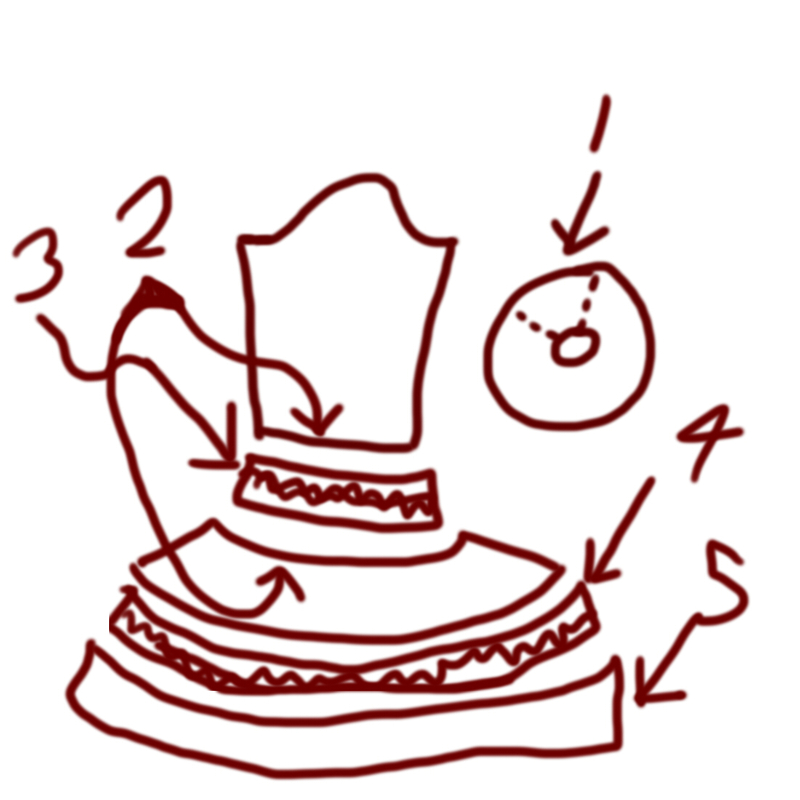 If you want the bells more poofy, leave the whole circle, or cut a bigger chunk out if you want more them more fitted. Whatever you do, you’ll still have to cut it open to make the seams work. Just make sure your two sleeve bells are the same size. Cut the bell 5″ long. 2. Sew the sleeve and bell part together. 3. Cut a 1 1/2″ inch wide strip 2 1/2 times the length of the seam connecting the sleeve and bell. Hem both sides of the strip, run a stitch on the longest stitch length your machine has, and pull the top thread to create a ruffle. Keep pulling the thread and wiggling the ruffles apart, keeping them evenly spaced, until it’s the correct length. Sew that ruffle over the sleeve seam, matching the middle stitching with the already sewn seam. 4. Measure how long the hem of the bell is, and cut a strip 1 1/2″ inches wide 2 1/2 times the length of the bell hem, same routine as before, hem both sides and ruffle it. 5. Cut a 2 1/2″ inch wide strip the same length as the bell, hem one edge, and sew it on. Then sew that ruffle on top of the seam, same as the last one. 1. Sew the darts of the bodices, and iron them open. 2. I took a piece of fabric, sewed horizontal pintucks, and left a space in the middle flat so I could sew on buttons later. Then I took another piece of fabric, sewed some more pintucks, and sewed that on the top of the first piece. Then I layed my middle piece pattern on top of that, and cut out my piece. I could’ve tried to figure out the math for how big to make the piece and then sewn the pintucks, but this seemed like the easier route. 3. Now we’ll sew the middle piece and the bodice pieces together. Attach the back pieces, sew the shoulders together, and side seams. Don’t sew the back seam yet, we’re going to put a zipper in later! 4. 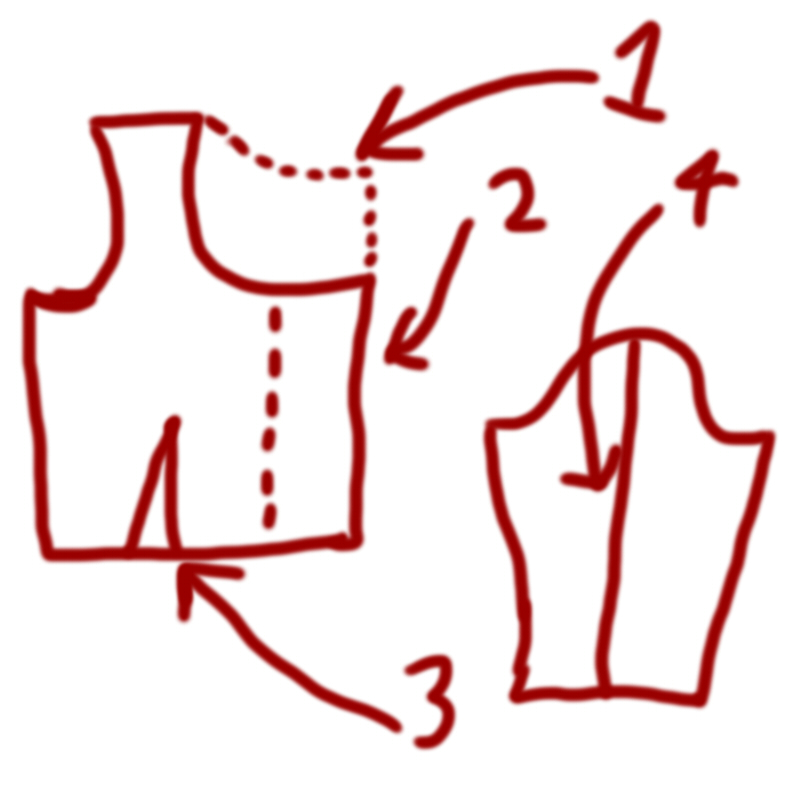 Hem your neckline all around, front and back, carefully minding your pintucks since that edge is already finished. 5. Measure your neckline all around, front and back, and cut a 3 1/2″ inch wide strip 2 1/2 times longer than that. Hem both sides, and ruffle it. 1. Now your going to add the ruffle around the neckline! I pinned this thing to death before sewing it on, since it doesn’t follow the neckline all around. It curves down under the armpits, so you might want to try the top on before sewing it down, to make sure both sides are balanced. 2. I lined up the middle seam of the ruffle with the very edge of the neckline, so it actually overhangs a bit. 3. Make sure you cut the ruffle in half where it hits the back seam, and hem the ends so it has a clean finish. Part six! We finally get to make the skirt! 1. You can use the same calculator we used for the bell sleeves here, stick your natural waist measurement in since this is a very high waisted dress, and your desired skirt length minus 11″ inches. This is a 360″ dress. 2. Cut a 5″ inch wide strip the same length as the end of your skirt. You’ll be sewing this to the skirt after adding ruffles to either end of the strip. 3. Cut two ruffle strips 2 1/2″ inches wide and 2 1/2 times longer than the length of that 5″ wide strip. Hem one side of the little strips, ruffle them, then sew them to the 5″ strip, one ruffle on either side. Then you’ll sew your big strip to the skirt, lining up the inside seam so you have the ruffle sticking out on top. Cut another strip 6″ inches wide this time, long enough for the hem. Sew it on, and hem it. Now you can sew the skirt shut! Part seven! Now for the weird peplum doodad. 1. 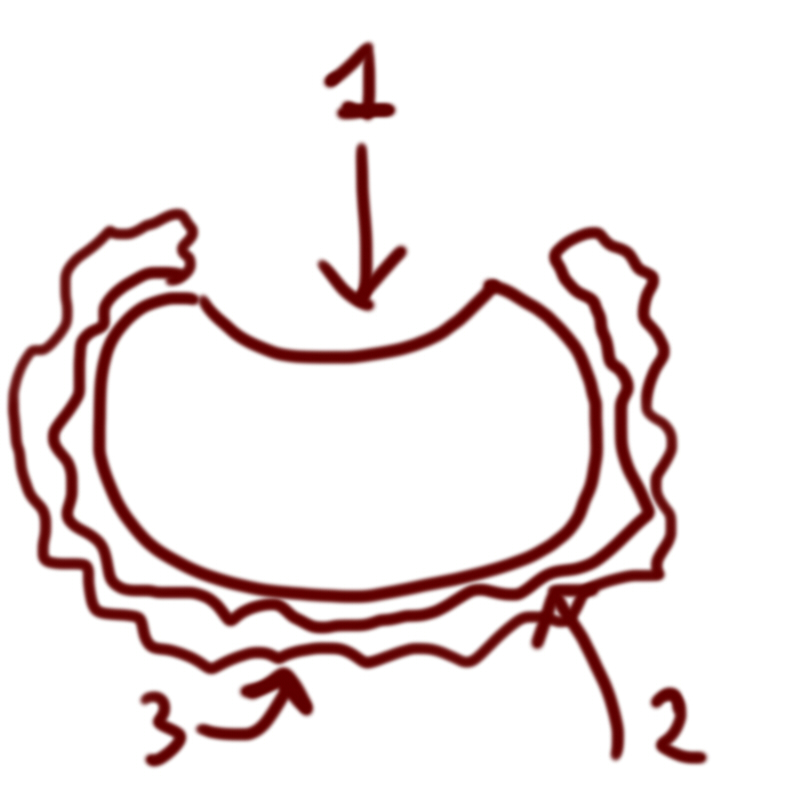 I’m not even going to try to say that this was patterned, basically I measured around my waist and figured out how far around me I wanted it to wrap, drew a curved line with that measurement using my bendy measuring tape as a guide, made it 15″ inches wide, and drew a weird circle rounded thing. I layed my fabric out on the floor and used chalk for this part. 2. Then cut a 2 1/2″ inch wide strip the same length as the hem of the peplum thing, hem one edge, and ruffle it. 3. Sew the ruffle to the peplum. Part eight, it finally all comes together! 1. Sew the sleeves into the top, and finish the side seam, trimming any excess fabric. Sew the peplum to the top first, double check that you have your right sides facing together before sewing, and that it will lay down the right way. Then sew the top onto the skirt making sure the seam of your skirt is hiding in the back under the peplum. Cut down the back of the dress and peplum, about two inches from the back seam, this will open up the waist enough that you’ll be able to step into the dress. Then sew in your zipper, I used a gray invisible one. 2. I made two fabric bows and hand sewed them onto the bodice, if you haven’t made bows before, here’s a great tutorial on how to do it. 3. I made two straps for the back, basically just two strips of fabric sewn together, then I turned them inside out, ironed them flat, cut the ends diagonally, hemmed them, and then sewed the two pieces to the back of the dress. The ruffles on the skirt wouldn’t stand up, even after I ironed them with starch, so I had to tack them down with a couple of hand stitches every couple of inches around the entire skirt. Then I sewed some buttons down the front, ironed out the whole thing, and if you were able to follow this weird explanation, you’ve got a dress too! If you managed to slog through this whole thing, I salute you! I hope this helps some of you lovelies out!